Hello! So today it is gloomy and a little chilly. You know, a typical blah January day. (I apologize to all you with January birthdays. It's just kind of a let-down kind of month.) I am stuck home with two sickies and one rambunctious definitely-not-sick-jumping-on-couches-four-year-old. It's the hard kind of sick, too. My littles are snotty and runny and super coughy and fairly miserable. I feel like we've gone through a box of tissues in an hour. But they are not so sick that they just want to sleep or lay on the couch and watch movies. They go and play for a bit, then come to me crying with hair full of that-stuff-that-runs-out-of-ones-nose. I snuggle them for a while, then we rinse and repeat the whole thing. Mostly the snotting and whining part. So what's a mom to do? #1, be grateful I can be home to care for them. Everyone knows you need your mommy when you're sick. #2, stock up on kleenex and go find a humidifier. #3, cross off the things that are on today's to-do list and put them on tomorrow's. #4? BLOG, of course! So in five hundred words or less (and a smattering of pictures), I thought I'd try to bring you up to speed on what we've been up to. While typing one-handed. Yep, I'm pretty awesome like that. #1 - My parents and little brothers joined us for Thanksgiving (+ my sister, her kids, and her special friend). It was awesome. My youngest brother recently got home from his mission, and it was great to see him again. We went out, we played together, we ATE together :), we talked with each other, my brother introduced us to English poppers (that's where we got the crowns) - it was really nice to have most of us together (we missed you J & D)! #3 - We spent Christmas in Nauvoo, Illinois with DH's family. We fit 25 of us in the Hyrum Smith farmhouse (really fun - I'd recommend it to anyone looking to stay there with family). 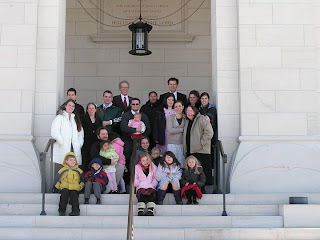 It was bitter cold, but we were able to attend the Nauvoo temple, it snowed on Christmas Eve and we went and sang carols at the temple, we visited some of our Church's historical sites (we would have done more but it was COLD! Yes, I am just a Texan now and yes, I am wimpy when it comes to coldness), we ate together, played in the snow, exchanged presents, watched movies, and more! It was especially wonderful to see all the cousins get to know each other. DH's siblings are pretty spread out - two sisters and a brother are in Utah, a sister in Oklahoma, us in Texas, a sister in Virginia/Washington DC, and a brother in Philadelphia. Before this trip, we hadn't even met a brother-in-law, a nephew, and a niece, and we hadn't seen the east coast families for about 3.5 years. We missed the youngest two siblings, but it was overall a really great trip. Oh, yeah, except the stomach bug everyone got on the last night :( There are two more grandbabies on the way, so we hope to see each other again soon! #5 - We are now back into normal life. It's been so long since I've really blogged, I feel like I need to write my little Christmas letter here! You know, the whole thing about what we've been up to and our various activities and achievements and stuff. Naw, I think we're good. I can blog about all that later. Horray! your sister is getting married. I feel like I know her, so I am excited for her. And Horray, you didn't leave the blogging world. I'm still expecting to see you, come May! What a great post! I love your family, and, I might be biased...but I especially love YOU!!!! I am so lucky to be your sister!